Award-winning filmmaker Helen Whitney has one over-arching goal for her four-hour production "The Mormons," which airs this spring on PBS. PBS is keeping a tight lid on the forthcoming four hours of documentary television that it is calling "The Mormons"--due to air on April 30 and May 1 on the PBS network. PBS's two-part, four-hour documentary "The Mormons" doesn't air until the end of the month, but The Church of Jesus Christ of Latter-day Saints is already trying to make it clear that the church itself did not produce the film. PBS has announced they will feature a four-hour, two-part documentary on The Church of Jesus Christ of Latter-day Saints, produced by Emmy-winning producer Helen Whitney. The film is set to air on PBS stations April 30 and May 1 (2007) at 7 p.m., (check local listings for times and stations in your area) and will be the first-ever co-production of the Award-winning shows, "Frontline" and "American Experience". I am relieved--I think. I just about I hr. ago got a call from N.Y., from Helen Whitney Productions, saying that they will not use my interview in this film that is to be aired next Monday and Tuesday. It was their last minute decision, "to save time"...The film will be shown Monday and Tuesday--2 hrs. each day. I am glad that I am not going to be in it--but on the other hand, am I not in it because "powers in charge" (LDS) did not want too much evidence against the church? In that case have they allowed the Mormon Inc to determine who is in, who is not, and what is said and what is not? I have been concerned that they might "cut and paste" from what I said and make it sound pro-Mormon and OK, even though what I said I was firm on the facts and that Mormonism is a counterfeit Christian religion... Now I do not need to worry about that--except how the Mormon Church will come out... perhaps all "good and wonderful"? We'll see and after that we can determine if the product is as Helen Whitney in her newspaper interview, about a month ago, had said--namely that after this film, only "ignorant people" will be against the LDS... Perhaps this is the reason why they are eliminating all firmly anti-Mormon statements. But all and all, I am relieved. It's like this program was written by the church. They start off by saying that what upset Christians about Joseph Smith is he claimed to have restored the church. No mention that he said all the others were wrong, et al. Great idea with the discussion board, Rob! When you watch this trailer, do you feel energized that the truth is coming out and stuff is getting exposed or do you kind of feel overwhelmed that the lie has gone this far? I'm amazed at the convergence of social, political, media attention on Mormonism right now. I watched the trailer. Just watching it made me so sad. Is being "gay" the only way they can fathom anyone being "at odds" with the teachings of the church? I'll be watching to see if that's the only group they represent as having a valid reason to separate from the church. It totally discounts the loss of so many of us. I know there is the gain of Christ, but the sacrifice is great for those of us who come out, and the slick message of the PR machine is sometimes overwhelming. Better read Ezekiel 13 about what happens to the whitewashing when The One True God steps in! It's called "The Mormons" and it's billed as one of the "great neglected American narratives." The four-hour documentary premieres on PBS on Monday. Documentary filmmaker Helen Whitney produced the ambitious three-year project that takes an in-depth look at The Church of Jesus Christ of Latter-day Saints. Interesting trailer. The series looks promising - even though a secular view, it seems the interviews will cover all perspectives. Anyone who's planning to use the two-part, four-hour PBS documentary "The Mormons" in Sunday School at their local ward is going to be sorely disappointed. But then so is anyone who's planning to hang copies of the program on doorknobs to convince members of The Church of Jesus Christ of Latter-day Saints to abandon their faith. We have never suffered a shortage of outside experts who would explain us to ourselves and the world. I saw a clip on PBS about the show The Mormons yesterday. The announcer said, "...A tribute to the Mormons." Translation, "They've given PBS a lot of money and we want to pay them back by giving them a favorable program about them." I don't expect interviews with evangelicals on the show. I found out who else have been cut from it: Steve Benson and Dan Vogel, and there might be others too. They could not allow Steve Benson in! He would be too dangerous for LDS Inc. I am sure that Dallin Oaks, Boyd K. Packer and other powers for the Mormon church, requested editing rights for this one before it was finalized--and they did not want those of us heard[,] who would say the way it is. I got a call last Friday, just about 6:00 PM N.Y. time, that they have decided not to use my interview. I think that the Mormon Church learned from the ["]Mormon Puzzle,["] 1997 production, made by SBC [Southern Baptist Church]. The [LDS] church wanted to edit that video, but since there had been no agreement to that made prior to filming it, SBC refused. The Mormon church was furious, but they could not do anything. If your beliefs are any good, you needn't be afraid to bring them out into the light. The proof: "The Mormons," a thoughtful two-part series on PBS. "How does the LDS Church go from being outcasts to being in the mainstream within two generations?" He didn't give an answer, but the answer is obvious: COMPROMISE. Give into the demands of political pressure, no matter what has been revealed through the prophets. You've got to hand it to the polygamists--Mormonism is perverse, but at least they've remained genuine Mormons, no matter how unpopular it makes them. 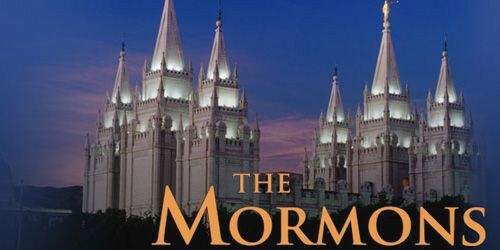 I thought "The Mormons" was an awesome documentary considering that it was from a secular perspective. I have only seen the first part... so may change my mind in the second part. I agree. I don't like the documentary's assumption that all religion is simply a matter of belief without corresponding to truth, but Mormonism just happens to be a recent religious development that is easy to empirically debunk. I really think that "they" were playing this documentary off as a favorable and fair treatment of Mormonism just to get LDS to watch it. One of my friend's LDS neighbors told her that the Jesus Christ/Joseph Smith DVD was false, and that she should watch the PBS special. I'm assuming this neighbor wished he had no longer given that advice! From what I saw, they weren't quite as one sided as I thought they were going to be, but still, it looked like much of it was written by a Mormon. (Did you hear the word "contention" in there?) There's a lot they didn't say... that ALL their professors were corrupt, etc. I'm not quite sure what their agenda was... I plan to watch it again on the PVR and extract some juicy bits. I'll make a screen shot of the lady doing the throat slit. I thought part 1 was pretty good. Obviously they didn't focus on ALL the issues. But I think it will serve the purposes I claimed. They started out OK. They pointed out the lack of transparency with the church finances. Then they illustrated all the Hurricane Katrina relief. From watching this, one would assume that the MORMONS were the only ones who helped down in Louisiana. THEN, they showed the PR stuff. Making the church look more Christian and Christ centered... whatever. Then the documentary talked about the history of racism. They talked about how blacks couldn't hold the priesthood...yada yada yada...true true true. I guess was little disenchanted because the documentary was setting up problems and then offering solutions. Blacks weren't allowed to hold the priesthood-----> Betty Stevenson (black lady) in church singing old gospel hymns and talking about how the Book of Mormon changed her life. Tal Bachman willing to blow himself up like a good robot on a mission (way to go BTW)------->Some "church historian" who claimed that on his mission he was able to speak perfect German to a Lutheran Congregation even though he was previously unable to do so. AND he further went on to declare that this was the moment that he KNEW (how absurd is that statement?) that the church was true. The angel Moroni statue looks JUST LIKE the profit JS. That is just a tad bit off-putting. I think it is because the church has distorted JS's image to look like Fabio (Bronze skin, sandy blond flowing locks of hair and crystal blue eyes). They have done the same thing with the statue of Moroni and paintings of Jesus. You know, 'white and delightsome'. "Mormon intellectuals are excommunicated". This segment went on to say that ironically Joseph Smith went against the traditional religious system when he produced Mormonism. This is true for JS and for converts too. You have a religion that encourages 'thinking outside the traditional Christian box' as a means to converting the investigator. As soon as the investigator is able to do so...the' thinking' is supposed to stop. BKP is quoted as saying, "one of the greatest dangers to the Church are gays, feminists and intellectuals." Then, BKP replies "I suppose ...uhhh...(chuckles) I think I remember saying those things. If it is in print, I said it. And uhhh... that is part of the alerting. And it is very simple. Down some of those paths, you have a right to go there. But in the church you don't have a right to teach and take others there. And without having some discipline simply because down the road there is unhappiness." BKP frightens me. I don't know if it is recognizable voice or his smugness. I flash back to the "little factory" talk and it sends tremors down my spine. Mark Jensen, Church Historian goes on to say, "we are not afraid of intellectuals or learning or knowledge. Where an intellectual, I think, can get into difficulty is when that intellectual person takes a position and begins to either attack the general leaders or the local leaders of the church or begins to attack the basic doctrine of the church and does that publicly." Does Mark understand the absurdity of his own conclusions? Good grief Mark! I don't understand how the average Mormon doesn't have a problem with this? Archaeologist Michael Cole states that the Mormons have been digging for 50 years in Guatemala and areas around and have not found anything. I think this will challenge some average Mormon's notions that there is archaeological evidence of the BOM. Hopefully, they will turn to our friends, Google and Mormoninfo. Grant Palmer says, "when I look at the Book of Mormon I don't see an ancient text. I see a large chunk of the King James Bible in a book that is reported to be ancient record of a people that lived 2500 years ago in ancient America...the eleven named characters in the Book of Mormon sound to me like Methodist stump speakers in that era (JS's time). What you find is all the issues that were being discussed and debated among Joseph Smith's family and friends in his own day. It is a 19th century record is what it is. It's not an ancient record." I can't add anything to Grant's statement, so I won't. Historian Jon Butler said, "Mormonism is a movement that celebrates it's history and yet it seems to be quite afraid of it's history. Often times afraid of real historical investigation. What did Joseph Smith think about the practice of magic? To what extent did Joseph Smith really practice money digging? To what extent did he forge documents? To what extent did he engage in illicit sexual behavior? All of those are questions that aren't particularly unusual in the formation of most any kind of religious system. They were imperfect human beings who engaged in imperfect behavior. Some Mormons have trouble accepting that. We want to kind of sanitize Mormon history." This SHOULD be a red flag to Mormons. Church Historian Jensen said, "I think the largest public relation sale we have to make is that this is the only true church." Sorry Mark, considering Mormon history and it's definition of "worthy", that is the NOT the hardest sale Mormonism has to make. Margaret Toscano talks about how her Stake President ordered her not to talk or publish her opinions about doctrinal issues. Specifically, her concepts of women and the priesthood and Heavenly Mother. She says, "I do not believe that a community can be spiritually healthy when it silences people. And that was my reason for not obeying the SP in the first place. I told him at the time 'I can not be silent. Because for me to be silent is to participate in an abusive authority and to damage the community that I care about." "I tried to come in and defend myself using argument and reason. In the middle of a sentence, the SP interrupted me and he said, 'we will not allow you to lecture us. We will not allow you to use this kind of reasoning again. You will only be allowed to speak when we give you permission." After a 20 minute deliberation, the SP claimed that the HC found her to be an apostate. Then they all wanted to shake her hand on the way out. They were being very "nice" and she said "there is something vicious about the niceness in this. The niceness covered over the violence that was being done." Ouch. Then Terry Givens says that it isn't possible to come to any fair conclusion as to what goes on in an excommunication hearing because the public only gets one side of the story due to the Church's position of not disclosing any transcripts to the public. LOL@Terry. To me, it seems that if the Mormon Church was REALLY interested in a "fair" representation of the facts, they would release the transcripts so we don't have to wonder if the one side of the story is accurate. Richard Ostling says, "All religious groups try to control their message and once in a while you will have a heresy trial in this group or that group. Mormonism is unique in the amount of activity that goes on and also to the extent to which the general membership is monitored. Apparently there are files in Salt Lake City on anybody who has raised embarrassing questions or might be a trouble maker. What you have is a church that seeks to control it's message down into the membership to strengthen the church and make sure it's message is clear and consistent and to make sure that dissent is limited to the greatest extent possible." This should be another red flag. The next segment talks about "families". The early Mormon family was the source of strength for early Mormons. Bushman says that sealing's of family's were a product of his (JS) time. Families were often separated and this brought them together. It showed an interracial Mormon couple getting married in the temple. HUH? Since when is this a typical representation of Mormonism? They talked about the church being family centered and the importance of marriage for all eternity. GAG. I did make an observation while they were showing the Mormon family with 11 children at family home evening. They all fold their arms during prayer. Isn't this a defensive posture/non verbal communication? The act of folding our arms while talking to our "heavenly father" seems odd in hindsight. In the section "Those who can and those who can't" they showed a clip of singing "I know my savior lives" from sacrament meeting. The husband looks like a zombie during what SHOULD be a joyous song. Then it goes on to talk about being gay, being a feminist and how these things don't fit in with Mormonism. I'm not gay or a woman so I can't really comment on it. But I suspect that the average Mormon will automatically dismiss these points of view because these people have problems with the church based on their life style and not on the counterfeit nature of Mormonism. Then they talked about this girl "Charity" who has primary pulmonary hypertension and is terminal. Her faith is strong and she knows the church is true. That was touching on a certain level. But they actually were singing AMAZING GRACE! WOW ...THEY REALLY ARE TRYING TO LOOK CHRISTIAN. I never thought I would see the day! Maybe they should read the lyrics first. The next section talks about the temple. It was pretty tame until Judith Freeman started talking about the spilling of the guts symbolism and slitting of the throat. Then it says that these oaths were dropped in 1990. Then they talk about the secret/sacred line. Then they talk about the temple recommend and worthiness. Someone called it, "a process to define people's religious devotion." I think that was true. Then, on the subject of baptism for the dead they claimed that Mormons have only baptized 100 million people. That is a low number considering how many people have lived and died. There are probably more than 100 million deaths every year on a global level. Then they showed Betty Stevenson (the female black convert to Mormonism) talking about her genealogy and how she traced her roots back to slavery. This is clearly a great example of the standard Mormon. In the last segment, it showed a guy talking about wanting to have another child and how his wife and he prayed about the decision. I was mentally checking out until they showed a family portrait of them all dressed in glowing (photo enhanced) white with a cloud back ground. This seemed gaudy and disturbing. Then we learned that his wife died of blood clot after giving birth to their 8th child. This actually broke my heart. That was horrible and I stopped watching. I can't stomach the idea of people dying for a fictional load of garbage. All things considered, I suppose it was sort-of-kind-of-'fair'. I think Part 1 did a better job but still missed out on several key issues. Hopefully this will get Mormons thinking about some of the problems with their authoritarian religion. Who knows? My chief and number 1 complaint about part 2 was their portrayal of people of African heritage in the Mormon church. Things may have changed since I was a member, but in my Stake (Texas) it was whiter than bleach on a cotton ball. I think this leaves a wrong impression to the outside world. The Mormon Church has a long history of racism but you wouldn't really know it from watching this. I wrote this letter below to Bill M., and few others. The only one I have heard back is Chip Thompson, who though that the movie was pretty good. He did not agree with my evaluations at all. ...Did you all see "the Mormons"--both nights, Monday and Tuesday? This was PBS's nationwide program, right? Ok, if you did, please let me know that you are as sick about this as I am? Last night's 2 hours were like being in a Mormon testimony meeting. Not only that but this was an obvious paid advertisement for Mitt Romney--this last episode started with his pictures and ended with them too. After Mitt Romney becomes the president (heaven forbid), LDS missionaries will knock on doors asking if they wanted to learn about "our president's church, the only true one"? And doors open wide... Gloomy picture, is it not? Lots of lost people will remain lost! We have a lot prayer and work ahead of us, more than ever. It would be interesting to find out who actually funded this 4-year effort of making a 4-hour film--" including 4-years of travels around the country and even overseas with many helpers, assistants etc. etc. The cost of this had to have been in millions, and millions. I wonder if Jon Huntsman, John Sorensen, Larry Miller, et al, super rich Mormons, along with the LDS Inc. paid it all? Who else could it be? (They may have also contributed under some "unknown names".) However, those who funded it had also a control of it. What mildly negatives was in this film, was to pretend and show some "token balance"... which was not much balance at all, considering all pro-Mormon stuff . Last night's episode showed a few persons who had something sort of negative to say were a gay man, and a feminist, and a lesbian-feminist... " and they would be dismissed by Mormon audiences as people whose words do not count for those reasons alone. So, what do you, smart people, say now? They dropped, eliminated all of us who had said something with some weight and truly Christian message. I gave a witness for the Lord Jesus and the Bible, but I knew she would not use that, even if she would have included 2 seconds worth of my over 2 hour on-camera interview... She said that she is an "agnostic Episcopalian" what ever that is! Helen Whitney's words, she gave to some LA and local reporters a month or so before, "that after people see this film, only ignorant people" will oppose the Mormon church, became a fact. I wasn't able to see it, but a co-worker's Mormon husband recorded it on DVD and I'll be watching it soon. Actually he called me to talk about it because he had some questions, and he knows that I know a lot about Mormonism. He didn't know about JS as a treasure hunter, nor did he know about using the rock to translate the book of Mormon or the mountain meadow massacre. We talked about it, and we had a great conversation about how Mormonism differs significantly from true Christianity. He was really questioning the Church, and I felt like he was using me as a shoulder to lean on, sort of speak. I referred him to your site and I sent him the Jesus Christ/Joseph Smith DVD. I'm excited where this may go. I'll keep you posted. The reviews of "The Mormons" are in and the 4-hour PBS documentary is mostly getting high marks. 150,000 Utahns watched part one Monday night and from one coast to the other, "The Mormons" is being hailed as extraordinary by television critics. Still, "some Utahns" found it a little too critical of the LDS Church. With few of the major issues facing the LDS Church left untouched, the final installment of the four-hour PBS documentary on "The Mormons" drew responses all across the board late Tuesday night among Utahns of different faiths--and particularly Latter-day Saints. The LDS Church characterized the two-part PBS documentary "The Mormons" favorably, noting correctly that some church members may have a mixed reaction to its treatment of sensitive church issues. PBS has produced two thought-provoking programs about The Church of Jesus Christ of Latter-day Saints. Aspects of the faith covered in the programs were broad and diverse, and the broadcasts are resulting in an equally diverse range of opinions and responses from viewers. Here are Deseret Morning News reader responses regarding "The Mormons" PBS series. In messages where only an e-mail address was available and the message itself did not identify the writer, "no name" is noted. On the PBS broadcast, The Mormons, I came away with the same sense thinking that this cannot be called a "faith promoting" piece by the Mormon Church. Too much of it was simply too damaging to their past and present operation to call it favorable. Let me put it this way. Tomorrow (Saturday, May 5) they will be airing their own "faith promoting" documentary in the state of Utah. That spoke clearly to me that they did not like "The Mormons." The question also needs to be asked why the Mormon Church officially spoke out against The Mormons prior to its airing? If they knew that it was favorable and, as some suggest, that they were financially or editorially behind it, then they would be contradicting themselves by warning their members about it prior to airing it. I think that their new move, in the post-airing mindset, is a scrambled attempt to reinterpret it in the best light as a counter-measure rather than as some kind of original plan. It is all part of their typical Public Relations stints. The ratings for it was interesting. The average PBS viewers in Utah float between 1.5% and 2% of the total households. During that program 17.9% of Utah households watched it. That is quite a jump and in spite of LDS PR people trying to spin it with positive voices, it did damage big-time--else they would not be scrambling to try to recover after its airing. There were parts that troubled me as far as giving a distorted, positive view of the LDS Church; one of which was the converted African-American lady who made the Sunday ward meeting look like a swinging Baptist Church. We all know how rare that kind of singing is in any Mormon Church service. Still, it was not without refutation. Just prior to her interview was the quotation from another African-American man who just could not believe in a church where the leadership spoke in the kind of racist terms toward blacks as what the LDS leaders did as God's prophets and apostles. Overall, I think that the film was as good of a piece as one could expect from a secular producer. Cindy, my wife, agrees and adds that every major area of Mormonism, from its history to its theology, is clouded by some kind of corruption, scandal, or black cloud overhanging it. Many of these things were brought out in the documentary. From Smith to Young to other leaders, their corruption in word and actions clouds their history and speaks loudly against them. It was not intended to be an evangelical Christian piece, therefore, it is not fair to project into it the kind of wants and desires that "we" would have done had we been producing it. Looking at it purely as a documentary, I think that it did a fair and good job of points and counterpoints, but in the end, if I were watching it totally unaware of Mormonism, I would walk away thinking "what kind of weird group is this?" They made the Mormon Church look like the cult that it is. Think of the mess--polygamy, adultery, strange revelations, weird visions in their temples, the Book of Mormon from a stone in a hat (thank you Dan Peterson), the Kirkland money scam, the Mountain Meadows murders laid at Brigham's feet, the racism toward negroes as a "revelation," the persecutions in Missouri are partially self-caused from Mormon retaliation, and a host of other things, but it is quite a messy church. Did you hear how Dallin Oaks portrayed a mindless following of the leadership without thinking for yourself? That is a "Jim Jones-ism" at its best--the cult mindlessness came right from LDS leaders and was backed up by ex-Mormons who were excommunicated for thinking outside the box. I truly can't see how someone would watch this and rush into the Mormon baptismal waters unless they are the gullible type who would discount evidence for the the sake of a burning bosom. I thought that the PBS special as a whole was very well done and very professional. The first night's "History" revealed more "anti-Mormon" information than I thought it would. It seemed to have some church history with a little bit from both sides. I wish they would have exposed more like why the retaliation at Haun's Mill occurred. It made the Mormons look completely innocent. Although I did not expect the part about the seer stone in Joseph's hat to translated the Book of Mormon. On the second night entitled "Church and State" I kept waiting to see Sandra Tanner but she never appeared especially when they were talking about "Mormon Intellectuals" leaving the church. I was disappointed by that. I thought that the second night was still very well done but I also wish that the last hour would have also exposed more of the distinct Mormon doctrines. It was genuinely nice & touching with the last family but it made the LDS Church look like mainstream Christianity. Rob to be totally honest with you I would most likely join the LDS Church if I did not know of it's heretical beliefs of God & man along with Joseph Smith's false prophecies. Then there's also Mormonism's fundamental requirement of polygamy for godhood and Joseph Smith's crooked dealings. So there is a lot that would keep me from becoming Mormon but if I did not know all that then I would most likely convert. I am very impressed by their good works, organized efforts, and active missionary program. I wish that all real Christian churches had the same good works. I was glad to see Mormon apologist Daniel Peterson admit that Smith primarily translated the plates using his existing seer stones with his face in a hat (behind a curtain). This is, to my knowledge, the first time a prominent Mormon has admitted this with such a degree of forthrightness and publicity. I was encouraged by the given context of the extreme religious fertility in New England and the Smith family's already-existing penchant for money-digging and strange visions (admitted by Mormon Terryl Givens). I was glad that Mormon scholar Richard L. Bushman publicly admitted that Joseph Smith's marriages to ~10 women who were already married (i.e. polyandry, not just polygyny). I was glad to see Bushman talk with a tone of shame about the issue that it deserves, and I was glad that Smith's sexual motivation wasn't discounted. I was also glad that the varying, growingly fantastic accounts of the First Vision were mentioned. Usually when these simple claims are put forth a person is accused of being a nasty, vicious, hateful, skewed "anti-Mormon". But these were Mormons publicly admitting to these things. It was also healthy to publicize Dallin Oak's comment that, for Mormons, even if the criticism is true, criticism of LDS Church leaders is always wrong. I think people needed to hear a Mormon leader actually say that with their own eyes and ears. Sometimes people chalk that kind of idea as just a mean stereotype of what Mormon leaders teach, but it really is true and that attitude is really there among "faith-promoting" church literature and CES teachers. Tal Bachman said something very powerful that I can paraphrase: Mormonism might be the greatest thing invented in the world, but if it is invented then it is not worth following. This was good to hear as I have heard so many Mormon says that even if Mormonism isn't true, it still might be worth believing. I haven't had time to field all the questions and comments about "The Mormons" piece on PBS. Personally, I thought it was about as exciting as sitting through LDS sacrament meeting. I saw the first night, and only saw the last 1/2 hour of part 2. The thing that was interesting to me was that it had a good snapshot of different people commenting. One of the General Authorities (Dallin Oaks, I think) telling people that it's never right to criticize the church from within (paraphrase) stood out. Saying that Joseph Smith was "the Alpha and Omega" of Mormonism almost made me choke, but, it's TRUE. So, some of the things that were said with such blase matter-of-fact candor are things that your everyday LDS would hang me for saying, because I'm an apostate. It deeply saddens me that the only representatives of those who have disagreement with the church are those who are either gay or have strong feminist opinions, and they seem to want back in. Those of us who left because of the exposure to the light of God's Word revealing that we are not what we were told all our lives, but sinners saved by a holy God, don't count. Our "anti" message is still as marginalized as ever. They showed a great picture of religion. But it's a religion that wants to be considered part of Christianity which it called "apostate" and "an abomination" at the "Alpha" time of JSmith. They really don't want to hear the truth about the Christianity they are now trying to join or the contrast to it. So sad. I guess the good news is that LDS will watch it, and there are some seeds of, "Is that true?" and maybe some rational thinkers may have "ah ha" moments... I have exLDS Christian friends who are excited about that, even though they know their LDS family would never admit it to them if they had questions...but I hope they know a Christian (WHO'S WILLING TO SPEAK THE TRUTH) to turn to and ask. That is God's miracle to perform. Helen Whitney said she expected criticisms from "both extremes" and your discussion page is fascinating because of the strong but opposite reactions. I sense great relief from some of the committed Mormons as well as from the Church on its web site. They must have been fearing something worse. For what it's worth, my 30 y.o. daughter had very little previous knowledge of Mormonism. She is a smart person who graduated from college with all As but chose to be a stay-at-home Mom, so she is sympathetic to the family orientation. She attends a liberal church that does not stress biblical literalism. She knows some good people on the university faculty who are Mormons, so she was curious about the details of the faith. She was shocked by the documentary. Her reaction was, "The more you find out, the weirder it gets." She thought the church's attempts to eliminate scholarly dissent were sinister. She cannot imagine a rational person embracing the gold tablets/Moroni story, and she agrees with the LDS Church official who said if Joseph Smith's stories are not literally true, if an angel did not literally hand him gold tablets, etc., the whole enterprise is a fraud. So her reaction, starting from a position of ignorance about the church, was quite negative. Consequently she assumed that this documentary would hurt Mormonism. Now I get online and see many Mormons having the opposite reaction, saying the documentary could help the church. One obvious explanation is that they are not shocked by familiar church beliefs, just relieved to have the big controversies handled carefully and LDS families were portrayed positively. What they cannot assess is the effect of exposing the core belief system to those who have not previously encountered it. Did anybody else get reactions from people with very little previous knowledge of Mormonism? That might be more significant than the reaction of people who are already "dug in" on one side or the other. The LDS church has a darker history than I knew existed. The movie maker included positive and negative information about the church. The people making negative statements for the most part "walked on egg shells", so to speak, to not appear to be mean. The all important issues about how Mormonism differs from historical Christianity were unfortunately not covered. I think it would be difficult for someone to watch the movie and then join one of the Mormon churches.